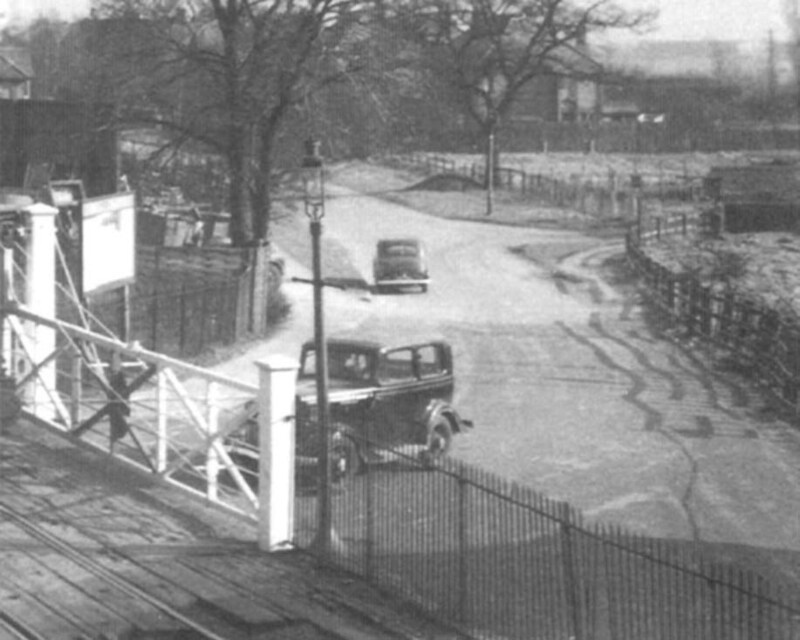 Close up of image 'lnwrmg2820' showing the level crossing gate protecting Elmdon Lane which is still in a rural aspect in 1955. Elmdon Aerodrome was located to the right of this photograph. The airport was created after Birmingham City Council decided in 1928 that the city required a municipal airport. In 1933 plans were submitted, identifying Elmdon as the site for the airport but no further development occured immediately being delayed by the Great Depression. However on 8th July 1939 the Duchess of Kent, Princess Marina of Greece and Denmark opened Elmdon Airport. The airport was owned and operated by Birmingham City Council with initial services to Croydon, Glasgow, Liverpool, Ryde, Shoreham, Manchester and Southampton. During the Second World War the airport was requisitioned by the Air Ministry and was used by the RAF and the Royal Navy as an Elementary Flying School and a base for the Fleet Air Arm. During this time, the original grass strip was replaced by two hard runways. Avro Lancaster and Stirling bombers which were manufactured at the Austin Aero Company's shadow factory at Cofton Hackett could not take off from the short runways at Longbridge. Instead they were transported by road, minus the wings that would then be attached at Elmdon. They were test flown from the aerodrome, and once declared airworthy they were flown to their operational units. On the 8th July 1946 the aerodrome returned to civilian use, though still under government control.